Get in touch to find out more about dates and availability. SOLD IN 24 HOURS. 4 bedroom duplex in Rosslyn Terrace sold for over 10% above Home Report valuation. LET IN ONE WEEK! Modern West end villa priced at over £3000 pcm, successfully let in just one week. 40 VIEWINGS AND SOLD! After 40 viewings, this beautiful Kirklee Terrace duplex sold for over the Home Report Valuation. WEST END PREMIUM! 2 bedroom duplex conversion in Hyndland Road let for a premium at £1400pcm. PRIVATE SALE AT £1.2M! We regularly sell off market and have recently sold a West End townhouse in excess of £1.2M. QUALITY TENANT IN DAYS! Bearsden home let in excess of £2000 pcm to a high quality tenant in a matter of days. Selling or letting, on the open market or more discreetly; we have active buyers and tenants looking and ready to move now. When someone in the family has a hearing loss the whole family has a hearing problem. – Dr Mark Ross PHD If that someone is you... • It might just be that other family members get a bit irritated with you at having to repeat themselves. •	It could be that they miss sharing things with you, like a joke or a favourite TV programme. At Clements Hearing Services we have helped thousands of people with hearing loss and their families. We’ve been helping them since since 1996, and we can help you too using the most up to date hearing aid technology. The most important thing to us is to give you good service. You get to know us and we get to know you. 18 Contributors this issue: Kieran Gallagher, Joanne Simms, Marilyn Thomson. Resolutions revisited! Remember those wonderful New Year’s resolutions which had crumbled by January 5? Now, in this new season of spring, it is time to pick up the pieces and start again! REAL NEWSPAPERS REAL NEWS! papersdirect, your local newspaper delivery agent, delivers your favourite newspapers: • by 7am weekdays, 8.30am weekends • any newspaper(s) to you HOME or BUSINESS • easy payments by cash/cheque/card/online/direct debit • with discounted newspaper offers and subscription vouchers • making immediate adjustments to orders when needed • straight to your door, 7 days a week, for less than the price of a coffee. If you want a better factoring service there is already a solution: Ethical Maintenance. Come along and try a Young at Heart Dance exercise class for yourself stretch, step, salsa and glide your way to a fitter you. No dance partner needed. All classes cost £5. Even if you have never done a dance exercise class before, these classes are created in a way that will enable you to get carried away with the music and have a lot of fun at the same time. “The Young at Heart Dance exercise class provides an excellent opportunity to enjoy an uplifting experience for body, mind and spirit in a relaxed atmosphere with like-minded people” Ann Beck, Bothwell - class participant. darkening too quickly, take the pan off the heat and continue to stir. When all the sugar has dissolved and you have a nice caramel pour in the orange juice and zest and stir to combine. Be careful as it will splutter and steam, which can cause a bad burn. When the caramel is liquid again, strain into a clean measuring jug and allow to cool. To serve, remove the possets from the fridge and spoon over some orange caramel. First impressions count; 47% of people first notice a smile when they meet someone, and 58% of people are more likely to be hired with a bright, healthy smile - so make yours sparkle! With that in mind, Visage Lifestyle Clinic are proud to announce four new Hygiene Treatment options to make that first impression unforgettable. All the above treatments also come with 20% off a future Platinum Polish plus 20% off for a friend/family. Call us on 0141 222 6580 or visit our website on visageglasgow.co.uk/ firstimpressions to book an appointment. FIRST IMPRESSIONS COUNT. Make yours unforgettable in just 15 minutes. Professional polish - clean, sparkling teeth for just £30. Glasgowâ&#x20AC;&#x2122;s only neighbourhood gift card! A new look for your old kitchen this Spring EST. No winter lasts forever; no spring skips its turn. I think spring has to be my favourite season of the year, although I can sometimes be heard to say autumn. This is partly because of the gardening calendar, but also because these two seasons are the least to be affected by the weather. In the west of Scotland summers can come and go in the blink of an eye and winters, as far as I am concerned, can be quite grim without any snow to brighten things up. Whilst autumn will always keep a place in my heart for bountiful crops and stunning hardwood foliage, spring marks the beginning of the year for me. The nights are brighter, the temperatures are beginning to climb to something more bearable and no amount of inclement weather will stop nature from pushing ahead. Firstly, a small application of a general purpose granular fertiliser like growmore in late February will help your bulbs get off to a good start. Obviously, it is too late for that this year, but worth bearing in mind for next year. A liquid feed can be applied to bulbs that are in growth or flower. It is normally not necessary, but can be advantageous to bulbs that are planted in containers and tubs. These have a limited amount of nutrients and feed available to them. For this purpose a liquid feed that has a good level of potassium is best as it will promote continued flowering. Tomato food is as good as anything else here and once every week or two should suffice. Bulbs that have finished flowering should be left in the soil until all the foliage has died back to ground level. This means the bulb is dormant for the year and can either be lifted to be stored or cut back to tidy up the appearance. As both the air and soil temperatures increase we can start to think about adding colour to the garden in the form of spring and summer bedding plants. These are cheap to purchase, easy to grow and care for and will supply abundant crops of flowers until the first frosts of autumn. The versatility of bedding plants has made them a staple favourite of almost all gardens and the choice of shape, sizes and colours of flowers guarantees that the most fussy of horticulturists can find something to make them smile. April is too early to plant the softer bedding plants without some protection from overnight dips in temperature, but the addition of frost protection fleece can negate the effect. Likewise, hanging baskets are susceptible to air frosts, more common than ground frost in Spring. There are still plenty of half hardy bedding and annuals that can brighten up the darkest are of the garden, though, and a trip to Cardwell will surely inspire you. Make sure to speak to Brian or Cheryl for advice suited to your needs. Lastly, use the last of the quiet time to plan and prepare your planting arrangement. Think about what you want to achieve and using what plants. Choose contrasting heights and foliage and arrange them from the perspective they will be viewed, ie put the short and trailing plants at the front and tall or climbing plants to the rear. We have the whole of Spring and summer ahead of us, @westendlife folks. Let us hope for a good one. NOW STOCKING LAWNMOWERS AND POWER TOOLS! BREAKFAST WITH THE EASTER BUNNY Cardwell’s Breakfast with the Easter Bunny is great value at only £8.95 and places can be booked by phoning 01475 521536. Breakfast includes a hot or cold filled, roll, juice, a cookie and a chocolate Easter egg. There’s lots more Easter activities at Cardwell, visit our website for more information. Scotland’s Gardens Glasgow’s West End Open Days Scotland’s Gardens is a registered charity created in 1931. 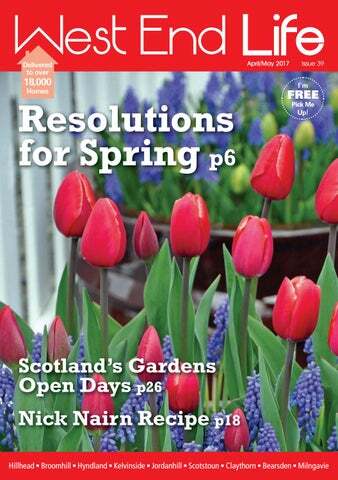 It raises funds for other deserving charities by facilitating the opening of gardens of horticultural interest of all sizes throughout Scotland to the public. The following three groups of gardens will be open in Glasgow’s West End. WHITTINGEHAME DRIVE GARDENS A group of four mature West End family gardens that have been carefully cultivated and developed over many generations. Each garden has its own distinctive character and many unique plantings. 5,5a, 12,20 and 22 Whittingehame Drive, Glasgow G12 0XS Open Saturday 3 June 2:00pm - 5:00pm, admission to all 4 gardens £6.50 including homemade teas. Beatson West of Scotland Cancer Centre receives 20%, The Vine Trust receives 20%, the net remaining to SG Beneficiaries. It’s time.....to ditch the winter woollies, the puffa coats, the Pom Pom hats and the wellies, (ok, maybe not the wellies just yet).....because, believe it or not, Spring is here! Hallelujah! crazy and mix and match both! Keep your body shape in mind though and use the stripes to your best advantage. To help you embrace the milder weather and to entice you with clothes that hint at the faint promise of a Summer still to come, here is a quick roundup of some of the most wearable top trends for Spring/Summer 2017 and what you should be investing in. Nothing groundbreaking here I know but a perennial favourite has been upgraded and brought right up to date with designers going for head to toe looks in bold, eye catching, bright floral prints. Cute little flower prints these are not, these florals are more of the look at me variety which although undoubtedly a statement look, is also really very pretty. You don’t need to take it to extremes though, one beautifully bold flower print under a bright lighter weight spring coat would definitely hit the mark. Flashes of metallic tailoring have appeared on fashion runways all over. From shiny oversized jackets and sleek silver and bronze trousers to shimmering short suits. Whether you want to make a bold statement in a head to toe metallic outfit or just slot in some metallics with your neutrals, it’s time to mix up your basic tailoring template with some metallic magic. Had a few late nights? No one has to know! Freshen and revitalise your eyes with this super 2 step eye kit from “Yes To”. Grab this beauty bargain from Boots now! Outlandishly coloured hair was a S/S 2017 catwalk hit. To follow this trend you don’t have to take the plunge with permanently dyed hair, you can now just use the new L’oreal Colorista 1 Day Colour sprays! •	Do	accessorise	simply •	Do	wear	with	poise •	Do	feature	a	pop	of	colour •	Don’t	wear	ill	fitting	pieces •	Don’t	forget	to	do	up	your	top	button! Pet food, treats, supplies & accessories direct to your door! LOYALTY POINTS every time you shop online! Osales@thepetshoppostie.co.uk Like us on facebook to receive our Weekly Offers! All brands at Great Prices! Thinking of selling? We are experiencing fantastic demand for properties in the West End. Corum only sell property and are housing experts. If you are considering a move, contact us on 0141 357 1888 and arrange a complimentary market appraisal of your property.